24 Jun 2017 April. Sunday morning in Brussels. We’ve been promoting the latest issue of the magazine at our own stand for four days now. The purpose of ArtBrussels is, however, not only to gain profit, but also to network, make conversation, survey the local art scene and find inspiration. 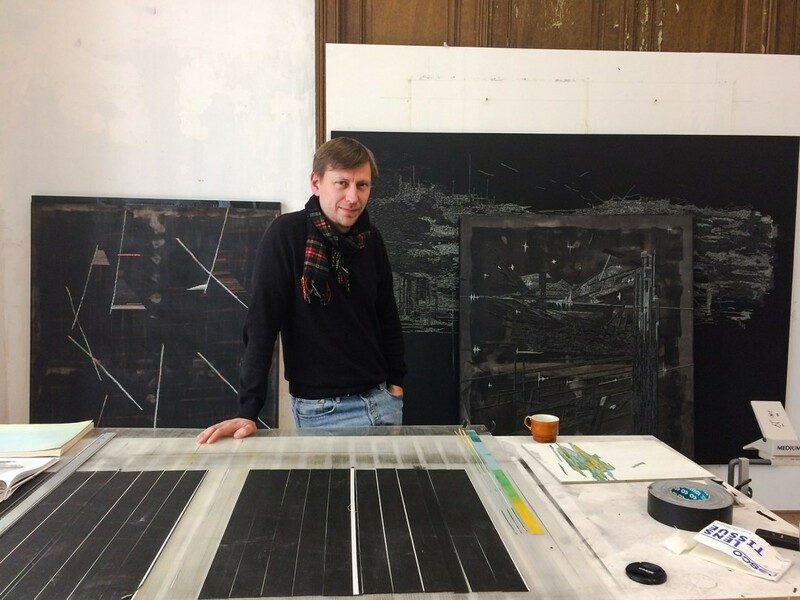 The day before we are scheduled to leave Brussels, we come across Marcin Dudek – a Brussels-based artist represented by the Harlan Levey gallery. In case you haven’t yet had the chance to check out the most recent issue of our magazine, let me tell you that Marcin designed the special insert. It features a selection of his artworks embodying issues that have always weighed heavily on the mind of someone who used to be a fan of the Cracovia football club, such as private stories, experiences of football fans, as well as the relation between the individual and the masses. Since we are both in Brussels, we decide to hang out in Marcin’s studio on Sunday morning to view some of his works in person instead of only discussing them. Marcin’s studio is located on the second floor of an impressive tenement house in the city center. The building accommodating only artists’ studios is situated on the other side of the street from the closed neo-Romanesque chapel. While Marcin makes drip coffee, I take a chance to view some of his works live for the very first time. 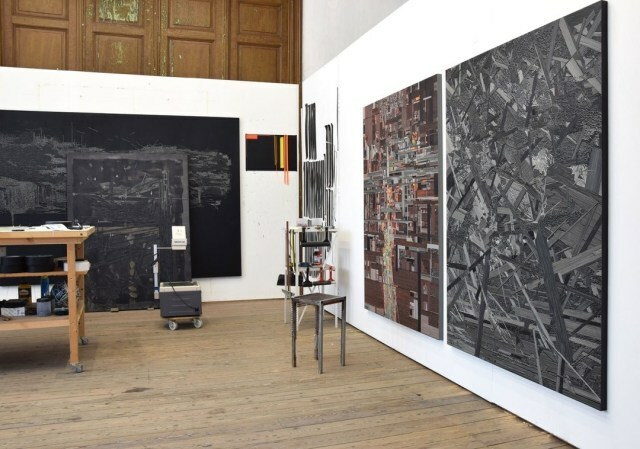 The relief paintings, which will be displayed at his two solo shows scheduled in the autumn in London and Brussel’s galleries, hang on the walls. They look incredible. I struggle to find words that would accurately describe them. You need to see those “paintings”, “reliefs”, “collages” with your own eyes in order to discern and appreciate their inherent nuance, which determines reception. What you will notice is the uniqueness of every single component, the painstaking attention to detail, e.g. 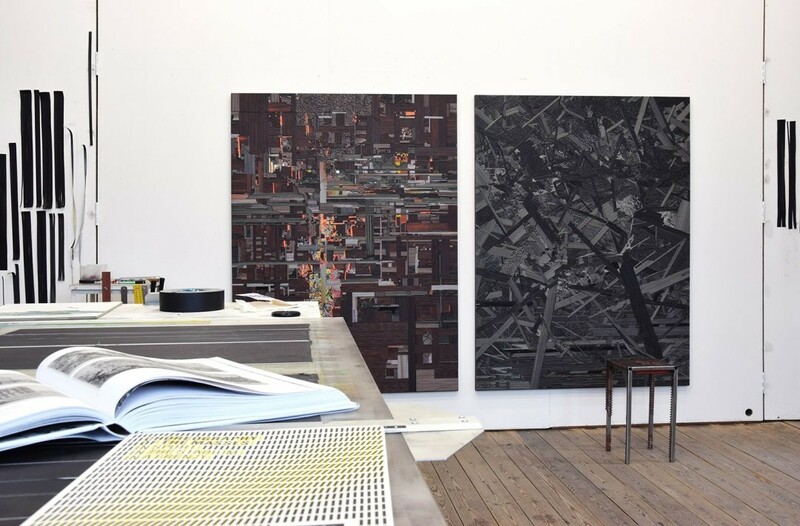 the way he cuts the tape, which is the basic element of his works, the tapes’ various shades, their width, amount, size, their layers and incidence. Let us not forget the viewer, whose vantage point is crucial for the works’ resonance and character. Marcin explains the principles behind the composition and its parts that merge into one mass. The tiny spots represent the crowd ravaging and eroding the urban landscape to establish a new order. As a result, his works of art become an organic urban relief of sorts. Marcin points at one of the paintings on the wall and mentions his wish to reach one million metaphorical spots, one million entities forming an uncountable set. The artist is, nevertheless, determined to carefully record and catalogue each and every spot. He counts and groups the mass…in vain? On the contrary. mass cannot be tamed, controlled and organised, can it? Mass is the meaningless conjunction, Baudrillard’s black hole. Masses bear no relation to the outside. They absorb individuals along with their emotions and needs, camouflage and protect their anonymity. In return, those individuals are electrified with the unprecedented power that keeps conducting until it reaches a critical point and thus implodes. Masses are mechanisms triggered when you least expect it. Their cumulative energy is transferred in an unpredictable and unbalanced manner. Dudek was absorbed by those masses that affected, stirred and controlled him. No wonder he seems fascinated with the notion of one’s autonomy and its limits. He gravitates towards exploring the behavioral patterns, role and function of an individual in a supposedly organised society. For all of the abovementioned reasons, separate points in his works must be accounted for.